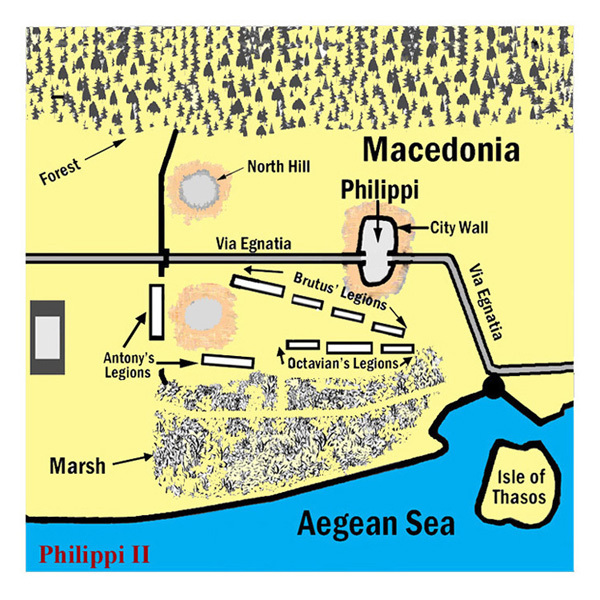 Click Second Battle of Philippi for a “FREE” download of this page in PDF format. On October 23, 42 BC, Marcus Brutus was in a difficult situation. He thought it best not to engage in battle with Mark Antony and Octavian. His supply lines back to the east were in excellent condition. On the other hand, Antony and Octavian were dependent on supplies arriving by ship from Italy at the port city of Dyrrachium on the west coast of Macedonia and then being transported east by land to Philippi. Brutus had his navy doing its best to attack Antony and Octavian’s supply ships as they crossed the Adriatic Sea. A disruption of their supplies would bring them starvation. With winter coming on, he believed he could win the battle by putting them under siege. But his army wanted him to fight. Their morale was low. They wanted to get it over with. The soldiers had feared Cassius, but they didn’t like Brutus, and they didn’t think he was a strong leader. They thought he should have followed up immediately after his victory over Octavian. Now, he was re-enforcing their opinion of him by his continued hesitation. Then, just as Brutus was hoping would happen, Mark Antony received a message that Brutus’ navy had destroyed his fleet of supply ships in the Adriatic Sea. Antony didn’t hesitate. He immediately forced the second battle. He knew that if Brutus found out about the destruction of the ships, he most likely would have been able to convince his near mutinous army not to fight and instead put him and Octavian under siege. Now that here was no longer any major opposition to the Caesarians. Antony and Octavian divided up the Republic. Antony took the eastern territories and Gaul (current France). Ruling from Rome, Octavian took Italy and all points west including Spain. Antony had the easier task. It was left to Octavian to make the arrangements for getting the large number of veteran soldiers who fought at Philippi settled on land and farms in Italy and other provinces. 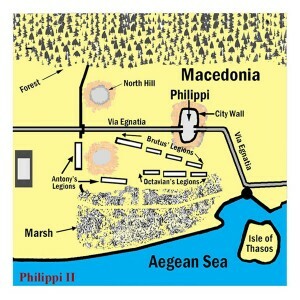 The two battles of Philippi in October, 42 BC, changed the course of history of Ancient Rome.